Finding the thin line between expanding a community while holding on to it’s hometown environment is something Williamston has found. Through the expansion of its downtown with new apartment buildings and restaurants, the community has still managed to keep its label as a small-town neighborhood. With an extensive restaurant list, and available housing directly downtown, Williamston has provided an exciting social agenda for its residents not only during the day but for night-life as well. According to the corporation Smart Growth America, smart growth is an approach to development that encourages a mix of building types and uses, diverse housing and transportation options, development within existing neighborhoods, and community engagement. Smart Growth America said aspects of smart growth can include a walkable downtown living area where small businesses are given the opportunity to thrive, and families are allotted to live close to their daily destinations. This gives the town an chance to thrive, prosper, and expand, while still containing the rural aspect they wish to hold on to. Bob Rogers, owner of Antiques Market of Williamston also agreed that Williamston allows resident to find quality, and unique products that you may not be able to find in surrounding cities. 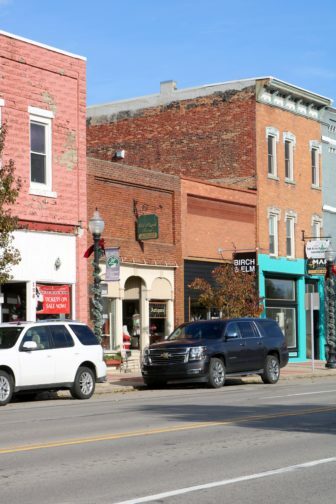 Downtown Williamston uses antique buildings for businesses. Photo by Camille North. The town of Williamston has portrayed characteristics of this specific advancement plan through various renovations and constructions in the downtown area. These include new apartments available for residents, the restoration of the original Williamston train depot into a museum, and even the advancements in technology in the old-fashioned movie theatre downtown. Williamston has just introduced the 304 River Edge apartments with 30 new and available one and two-bedroom luxury apartments for its residents, conveniently located directly downtown, just off of Grand River. While the businesses located directly under the apartments have not been completed, applications for leasing the apartments are available to possible or current residents of Williamston. Giving residents the opportunity to live close to downtown quarters and near their everyday activities causes the complex to be prime housing units. Williamston has taken the unique characteristics it portrays for its residents to its advantage. 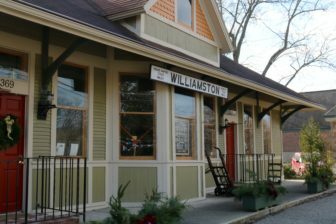 Through the renovation of the train depot, Williamston has preserved its history, and restored it to modern day standards. This allowed Williamston as a town to stay up to date and in competition with surrounding cities, while remaining antique and distinctive, which is the exact environment residents look for when coming to the town of only 4,000 residents. Johnson said the museum also provides education opportunities for residents and other presentations, exhibits and tours and participates in community activities such as the Red Cedar Jubilee and December’s Light Parade. Johnson also said when the original plans went through the restore and preserve the depot, it took various fundraisers and hundred of volunteer hours to complete. After the completion, the city decided it would not only house the town’s historical museum, but the office for the Williamston Chamber of Commerce as well. According to Smart Growth America, giving residents the opportunity to engage and interact in their community, directly through the historical learning of the town is a prime example of how Williamston has chosen to grow in the “smart” direction. Williamston businesses have also followed in the same path, but not only restoring their personal building’s exterior or interior, but the technology as well. The Sun Theatre have updated their technology to stay in competition with modern theatres. Photo by Camille North. 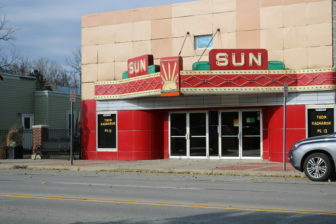 The Sun Theatre, located on Grand River in downtown Williamston has kept up with the ever-changing society, and advanced their own business as well. The antiquated theatre has preserved its original aspect through various characteristics over the years, including no credit or debit card machines. Warner stated the owner has chosen not to upgrade the cash system for speed, stating that adding credit card machines would only slow down business for unnecessary reasons. “It’s all about mental math,” Warner said. While the process at the theatre may be outdated and unorthodox in comparison to surrounding businesses and restaurants, this has allowed the theatre to capture the small-town environment that Williamston’s downtown gives off to its residents. 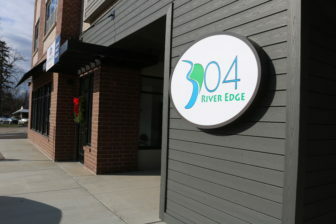 The new 304 River Edge apartments are located directly downtown. Photo by Camille North. Gilroy said currently the town has made comments about interest in purchasing available property in and around the industrial park to the south of the town, as well as property located directly off of the I-96 Williamston/Dansville exit. The town is also currently in the process of the expansion of new homes being built in the Forest of Nottingham subdivision, located to the south of the downtown area. No later than this spring, Campus Village developers plan to build a new apartment complex on Grand River Avenue in Meridian Township. The actual address where the new complex will be built is 2655 Grand River Ave. Interesting that you have omitted mention of the Williamston Theatre, central Michigan’s ONLY professional, resident theatre company. This company has won national awards and recognition, and brings over 11,000 patrons to the downtown area from all over the state each season. It’s an integral part of the economic success of Williamston. It should have been included for a complete picture.